Photo taken by my father sometime between 1968 – 1971, from the Lawrence School (where he taught). Click through on image to see a larger version. During the months of February through March, a total of 52 tons of soot drenched this city per month per square mile, Alderman Romeo W. Beaudry tonight reported to the Board of Aldermen. This figure was confirmed with 55 tons that poured over New York City for the entire year of 1936 prior to acceptance of smoke abatement regulations. The Alderman’s figures were provided from a result of a state survey conducted in this city, and were cited in defense of his order that the board instruct the mayor to engage the services of a highly qualified technical engineer to study the soot menace in this city. The order was adopted. Recommendations suggested in the report were also mentioned by Beaudry. 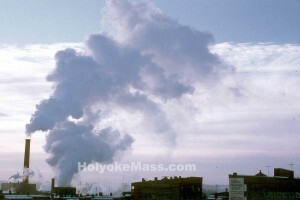 They included advice that Holyoke design a workable smoke abatement program patterned under forms of Chapter 140, Section 132 – 136 of the General Laws, that a smoke abatement division be created and supervised by a qualified engineer, that the division be granted enforcement powers described by law, and that a regional abatement program be considered. Adapted from The Springfield Union.